I received a copy of this book from the publisher years ago. Sophie Hannah is one of those authors I've been meaning to read for ages. I'm currently culling books in a huge fashion which means many plans and intentions and hopes of what I will one day read are dying. But I'm also chucking some books into a "read soon or else" pile (if they are slim novels they have a better chance to land there!) 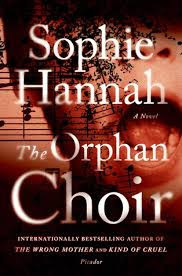 The Orphan Choir is one of those books since it was billed a horror novel and so I finally had a chance to read it this past week. The novel starts out well with a great emphasis on the protagonist Louise experiencing a kind of noise pollution from her neighbor. As the novel progresses, her neighbor's actions become seemingly more sinister and aggravating. Louise can't cope. Additionally, she's struggling to come to terms with renovations her husband wants to do on the house and the absence of her son from her life. Her son is staying at school where he's a part of a prestigious choir and it's hard for Louise to deal with his daily absence as well as the control the choirmaster has over their life. Things escalate as the noisy neighbor problems continue and Louise feels unsupported and overwhelmed with grief. This is a horror novel, and while it started out promising enough, I have to admit it ended up falling a little flat. The beginning was stronger than the end which ended up feeling a bit rushed and confusing. And even now, I think even the dread, the misery, and the torment of the beginning could have been developed even more. Still, it was a quick and entertaining read, and I liked Hannah's style and will try some of her mysteries in the future!